Bryan Adventures: Frontier Days and "'Box On!" Frontier Days and "'Box On!" 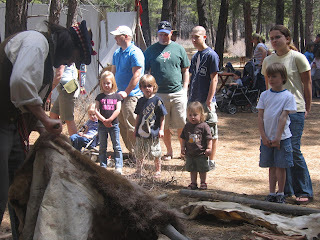 This afternoon for fun we decided to go out to the High Desert Museum Frontier days. Can I just say... I love having an annual pass because we could just go out there for an hour and a half and I didn't feel like I had to stay to make it worth my $. The family who arrived at the same time as we did payed $32 to go to the museum today, and we were right behind them as they left! Crazy! I would NEVER let my kids leave after and hour and a half if I had payed $32!! Anyway... they had an encampment of the Hudson Bay Company. 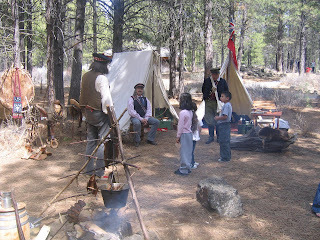 This is the trader and the general in the encampment and some fish and elk ribs roasting on the fire. When Sandra was here we were wondering about how and when the Indians did the beading, since the beading is so prevalent in their clothing that we see, but the beads we saw were imported. So... I asked the guy who was there and he said that before they could trade the beaver pelts for seed beads they used porcupine quills and sliced and dyed them. Wow! What a lot of work! I thought wow... I really am lazy! 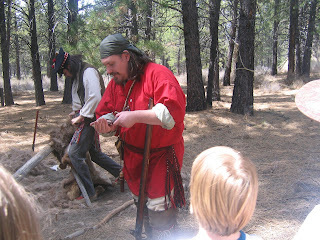 Here is a trapper taking the hair off an elk hide. Earlier I had thought I smelled dog poo, but realized there were no dogs in the park and passed off the stinky smell as the lady beside me. 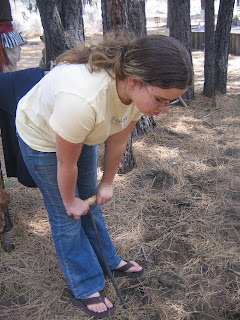 Then as we checked out the trapper guy I smelled it again and saw Elise checking her shoes to see if she had stepped in poo. 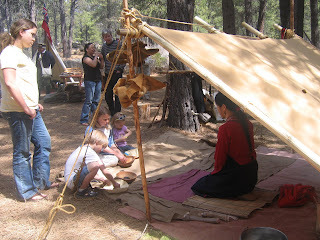 It was then that our trapper friend told us it was the elk hide (and here I had blamed in on the poor woman :-( ) P-U! I surely wouldn't want that job! This guy showed us how to fire a musket. 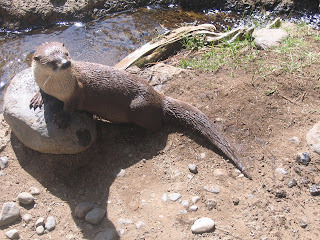 Finally we got to see the river otter! It was a beautiful day and we learned a lot. It was very interesting. 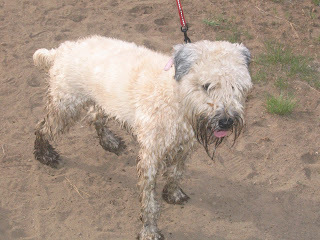 Even Samantha who had poo-pooed the idea earlier said she was glad we had gone. After we were done at the museum we decided to go letterboxing. It has been so long since we have gone, I thought it was time we picked it up again. 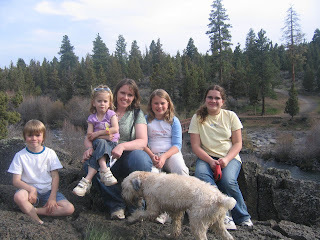 Letterboxing has taken us to so many cool places that we wouldn't have ever found other wise, and it is just plain fun! Today's letterboxing sent us to Sawyer Park just on the north west edge of town (10 min). It was so neat there, and we never knew it existed before! There were so many birds it was amazing. Next time we will have to take our bird guide. 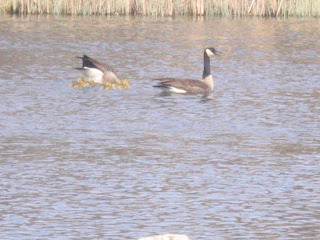 One of our neatest finds was this pair of geese and their 5 goslings. Star enjoyed trying to chase after the ducks and geese. What a mess! I can't take credit for "discovering" it however. My mom saw an article in the paper a few years a go and we have been having fun doing it ever since! I always though letterboxing sounded fun. Then when we found one when we visited you guys last year I realized it's pretty cool. I really want to start doing it. I even checked some craft stores but nobody knew where to get the kits to make your own stamps. I want to start doing it soon. There's quite a few here in Az you told me about. I was just telling Christina last week that I think we should start letter boxing again. It really is a fun and rather inexpensive activity where you get to explore your area a little deeper then you normally would. Sounds like that place is really cool and how gross about the animal hide. yuck! That's funny--just today our home teacher asked us if we knew what letterboxing was, and I told him I had friends who used to do it in the Boston area! Box on! I had actually never heard of letterboxing. This was very interesting. Maybe the next time you go we could come with and watch how it goes or do a fake one to get the drift even better. As far as the museum pass...I always say we're going to get one and then we never do. We always go on the free days and it's so packed. One of these days I'm going to quit talking about it and do it.